As university students, we spend most of our day around new people with different habits and shopping trends. We then realized that people's habits shape the society and as a consequence the city and living space that we share as a community. Thus we wanted to come up with a visualization tool to enable both consumers and businesses to have a global view and understanding of the trends and directions of all sorts of markets. 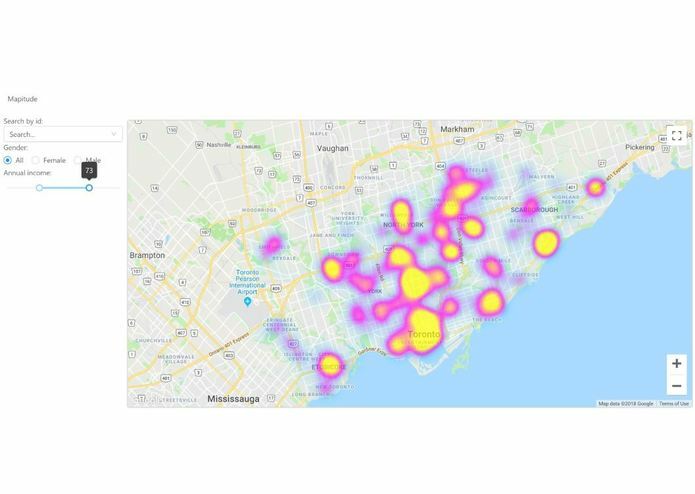 Mapitude collects TD Bank's consumer's information and after some processing, it displays it on a map with heat prints to show what are the areas where most consumers buy the most and where, consequently, sellers accomplish the greatest number of deals. The web app provides options to filter the results by various criteria, such as gender, age, amount spent and yearly income. Further, by hovering over a heat zone it will display all transaction details in that area, to give insight of the demographics of the people making purchases. Finally, each heat zone will give the user the option to predict what kind of customer is most likely to make a purchase at that location, using machine learning algorithms. The front-end is built primarily with react.js and various CSS frameworks, including Ant Design. The back-end is built with Node.js and the server side is supported by Firebase instead. For the machine learning algorithms, we used IBI Watson Studio. Some of our major challenges included understanding the new frameworks that we decided to work in and comprehend the data that we had to manage. Combining all the different parts of the project was also a tough job and required input from all of us. We are very proud of having built a project that integrates new technologies for all of us and that has the potential to give really insightful data to consumers and businesses. We learned to work together in a team, think under stressful conditions and become familiar with new frameworks and technologies. We are very excited to present and to show what we have built to all the judges!